Offering broadly similar connectivity to the Cambridge and Onkyo models (video output on an S-video socket only), the NAD IPD-2 is, however, rather more closely tied to its manufacturer's own systems. It has a data port intended to connect to a matching one on a NAD home cinema receiver, which allows advanced functions involving an on-screen display to be used. Still, normal operation is perfectly possible using either the iPod's own controls or the NAD remote and sound will, of course, be the same. This unit also has a bit of weight added to its base, which makes it pleasant enough to use. 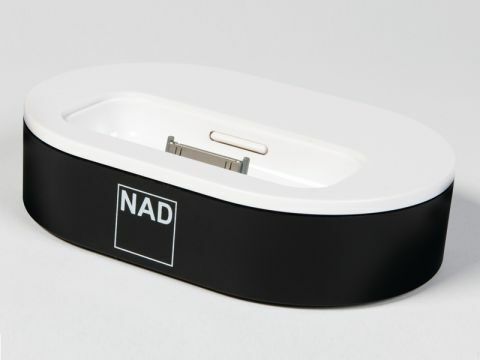 Like Onkyo, NAD has not boosted the iPod's output level, which remains at the 0.7-volt native output level of the device. We're not keen on that feature, as it means the volume control must be turned up quite high on the amp, resulting in the odd nasty surprise if one then switches to CD without readjusting! But once again the sound makes a strong case for Apple's little music storage devices. We felt that the treble sounded a little tight and constrained through this dock, but its performance in the lower octaves is very likeable, with both grip and drive giving the music a real sense of purpose. There is also some good detail, especially in the bass: it may seem a little dry at times but the insight it gives is certainly welcome and a useful antidote to the rather vague quality of the bass on all too many recordings. Imaging is slightly less full than one might expect from a decent mid-range CD player, but is generally stable and believable.